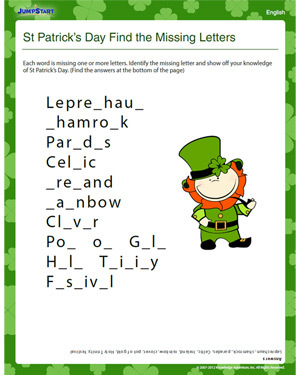 In this worksheet you’ll find some of the words and terms commonly associated with St Patrick’s Day – a traditional Irish holiday to celebrate the birth of St Patrick, the patron saint of Ireland. The catch is, all of them have one or more letters missing. It's up to you to identify the missing letters and complete the words. I’m sure you’re ready to take on the challenge. Bring it on!